Ten years ago, when his pastor discovered he was gay, Griffin Matthews was kicked out of his church, where he sang in the choir. Feeling depressed, the New York actor booked a ticket to Uganda for mission work. What happened to him next is the subject of a new off-Broadway musical, "Invisible Thread." At the start of "Invisible Thread," Matthews walks out on a stage covered in red dirt and addresses the audience directly. "My name is Griffin," he announces. "And this is my story." Matt Gould, left, and Griffin Matthews. Matthews, along with his writing and life partner, Matt Gould, co-authored the show. It quickly shifts from the New York church to the Uganda mission, where Matthews discovers that the man leading the organization is corrupt. Disillusioned, he leaves and strikes out on his own. "I had to figure out what I was going to do for the rest of my six weeks in Uganda," he said in an interview. "And so I walked down the road, tried to clear my head and met a group of teenagers who stopped me and said 'mozungu,' which means 'white person.' So, I got all the way across the world, as a black man, and to them, I was a white person!" he said with a laugh. The teenagers were all orphans, many because of the country’s AIDS epidemic. None of them had the money to pay for school. "I agreed to teach them in a library in the village, and so we started meeting for daily classes," he said. After he returned home, Matthews continued his relationship with most of these young people and started to raise money to send them to school. It was Gould, a songwriter, who heard music in his boyfriend’s stories. "And I said, 'Hey, why don’t we write a musical about your experience in Uganda?' "
Matthews said he told Gould it could be a way to raise funds, then quickly decided that it was a bad idea. "Nobody wants to hear a musical about Uganda," he remembered thinking. Gould countered, "But I thought they did." Gould wrote five songs, which the couple did use for a fundraiser. 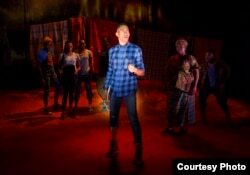 Then, those five songs turned into a full-length musical, which director Diane Paulus urged them to make more autobiographical. The invisible thread of the title stretches between the gay interracial American couple to the Ugandan teenagers, who live in a country with strong anti-gay laws, although the young people — in the show and in real life — accept the couple. And that thread has been woven into a very visible cloth. Matthews said the money raised from all the various versions of the show amounts to about $200,000. And those teenagers that Matthews and Gould initially sponsored? Most have graduated from college; some have become nurses, one is a surgeon, another works as an accountant, and one has even become an actor.